There was only one review this week and it was a goal/no goal decision – did the ball wholly cross the line? After Video Review the goal was given. We look at how this review was completed and PRO’s analysis of the incident. We also share an inside look at how a check goes when there is a delayed offside flag. 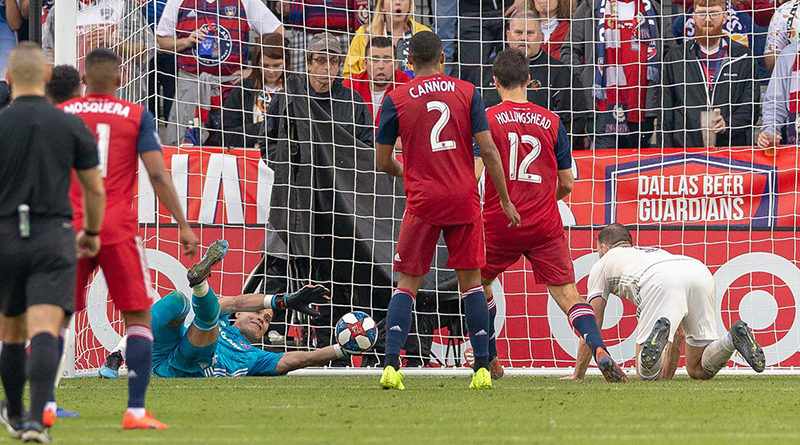 What Happened: Kei Kamara (COL) headed the ball against the post from a freekick, it was then followed up and directed towards the goal by Tommy Smith (COL); DAL goalkeeper Jesse Gonzalez appeared to save the ball. It is unclear during live play if the ball had completely crossed the line and the referee allowed play to continue. An on-field review was recommended by the VAR since there was clear evidence that the ball had completely crossed the goal line and a goal should be awarded. After the review, the referee awarded a goal. 30 seconds after the incident the VAR decided that the ball had completely crossed the line by using the TIGHT camera angle and zooming in. 40 seconds: Before recommending a review the VAR quickly checked to make sure that there was no offside infraction on the initial cross. No offside. 60 seconds: The VAR took a look at Smith (COL) to make sure that he did not play the ball with his hand using the JIB camera. 1:10 VAR stated he has a good goal and recommends a review. The VAR showed the referee the freeze frame from the TIGHT camera with zoom. PRO’s Decision: Admittedly the TIGHT camera would not normally be the best angle to use to see if the ball had completely crossed the line, but in this case, it was the only angle that clearly showed it. All side angles were blocked by the goalkeeper’s body. However, the angle provided is more than sufficient evidence that the goal was scored. This was a good use of the Video Review system. In the 49th minute Real Salt Lake scored a goal against LAFC that featured a delayed offside flag. Here is what happened behind the scenes during this check to confirm if the offside was indeed correct. During Live Play: At the moment that the ball was played by Damir Kreilach (RSL), Assistant Referee Felisha Mariscal determined that Sebastián Saucedo (RSL) was in an offside position. She immediately said “delay, delay, delay” to let the referee know that she was holding the flag until after the end of that immediate opportunity to score. As soon as the ball entered the goal, the Assistant Referee raised her flag and said “off, off, off” and then the referee blew the whistle. This is PRO’s best practice for using delayed offside flags with Video Review as it opened up a window for the VAR to check the on-field decision. A flag and/or whistle could have impacted on the play and closed that window. As soon as the goal is scored the VAR reviewed the footage to check the offside decision. 10 seconds in the referee told the VAR that the on-field decision is offside – no goal. This step is important because inside the VOR it might not always be clear what the on-field decision is. 15 seconds: The AR informed the VAR that the offside was at the far side of the penalty area. 20 seconds: The VAR informed the referee to delay the restart as they are still checking. 27 to 35 seconds: The VAR along with the AVAR receive the exact frame when Kreilach last played the ball. 45 seconds: Using Left 18, the VAR and AVAR can see that Saucedo is in an offside position. PRO’s Decision: This was a well-executed check of an offside decision when a goal was scored. Because the AR had delayed her flag and the referee held the whistle until the ball had entered the goal, the VAR was able to confirm the correct offside decision. Additionally, this was a correct offside decision as the ball deflected off Eduard Atuesta (LAFC) and this would not be considered a deliberate play. Kreilach played the ball which then deflected off Atuesta from extremely close range and the offside position is judged from that point. Saucedo gained an advantage from being in an offside position and was therefore penalized. This was a good use of video review.